[Montréal, Québec, Canada 32°C] After reading Islands of Resistance: Pirate Radio in Canada, all I wanted to do was become a pirate. Not the kind that steals from the rich in a capitalist bent to become rich myself at the expense of others. I wanted to appropriate what is already mine: the public airways, and broadcast what corporate media despise most: defiant free-form radio that encourages audio creativity and promotes social justice. The 246-page anthology, edited by Andrea Langlois, Ron Sakolsky and Marian van der Zon, is a collection of 16 essays and a docudrama in seven acts that explain why pirate is important in a digital age, with tons of examples of where its practices across Canada. Resisting regulation, radio and anarchy, indigenous voices, protest tactics, temporary autonomous radio, radio art, gender politics and more are all discussed in detail throughout the book with a dissenting flare that led to my favorite open source torrent software to find myself a copy the 2009 film, Pirate Radio, a feature-length fiction about an offshore pirate radio station, based on such dissenting luminaries as Radio Caroline. Radio Luxembourg, Radio Atlanta and many others. Broadcasters don’t need to be on a ship to be pirates. They can broadcast their voices from the forest as as they do in Barrier Lake, “one of the poorest native communities in Canada.” This indigenous community is located just five hours northwest of Montreal and, is today “perhaps the southernmost example of a traditional, sub-Arctic hunting society in Canada” where the youth still speak the Algonquin language. Traditions and their native language are threatened by the lack of schools on the reserve, forcing kids to towns like Val-D’or and Maniwaki more than 150 kms away. The ‘Voice of the forest’ broadcasts are listened by youth from the community as well as by the elders, bringing them together. One anecdote that emphasizes community in the radio project is of an elder woman drives up to the radio station to tell the DJ, “No more Rap! Put on some country! We want to dance!” before driving away again. Apparently, a lot of people including elders were at someone’s house listening to the radio. The DJ responded by putting on “a large selection of country tunes, set the playlist on repeat with some premixed station IDs mixed in, locked the door to the [station] and headed [out]” to a friends where a slice of the community were also listening to the country music they just put on. Developing a listenership is not easy but in Barrier Lake, the community was listening. Setting up radio broadcasting capabilities like they did in Barrier Lake will have long term benefits for the community but pirate radio is also exceedingly useful for the short term as a protest tactic. The chapter, Amplifying Resistance, discusses the role of low-watt broadcasting during protests to offer protesters information about the meanderings of a snake march, the movement of police, and of arrests. Another important use often overlooked by activists is the possibility of using the broadcasts to inform the adjacent community of the protest’s underlying issues. By promoting the location on the FM dial to residents along a protest route, they can be encouraged to tune in and listen to a live broadcast coming from within the march. I remember Free Radio Tent City that authors, Andrea Langlois and Gretchen King, write about in the chapter. It was a low-watt broadcast during the July 3, 2003 occupation of a Montreal park to protest the lack of affordable housing during a housing crisis that found hundreds of people unable to find a new home by the time their leases ran out on July 1st. Protesters were encouraged to bring their own radios to the protest and tune into 104.9 on the FM dial. The broadcast unified the squatters by tuning everyone in to a collective voice where listeners were encouraged to share the microphone and join the conversation. These few examples give a glimpse of how pirate radio is being used and practiced across Canada. The book’s editors note that pirate radio projects are not necessarily easy to document by the ‘illegal’ nature of their broadcasts and their efforts to remain clandestine efforts. Others did not wish to be sited of referred to in the book for fear of government reprisal. 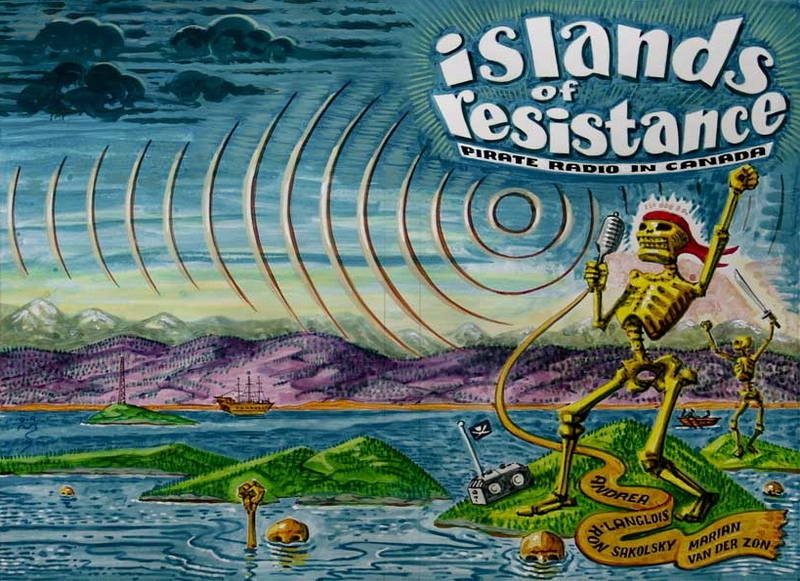 I am glad Islands of Resistance is filled with gaps of information about the pirate radio mediascape because it’s nice to know that there are still pirates out there whose furtive efforts have kept wind in their sails.